District Governor Susan Wakefield OAM was delighted to receive a real financial bonus for District 9685 and The Rotary Foundation’s END POLIO NOW campaign during her recent official visit to the Rotary Club of Belrose. President Shane Broekman presented a cheque for $100,000 from the deceased estate of resident Kathleen Sheather. Fortunately for Rotary and three other charities, Rotarian solicitor Kos Psaltis was requested to advise on suitable charities for donations from the estate and $100k has been donated to The Rotary Foundation – specifically for the Polio campaign, along with The Fred Hollows Foundation, Cancer Council and Westmead Children’s Hospital. District TRF Chair PDG David Rands was aware of the pending gift and was delighted to learn of the recent presentation. He emphasised that the best news was that the $100,000 will become $300,000 when Rotary applies the multiplier effect of the Gates Foundation and other bonuses. Mark and David Anderson of the Rotary Club of Beecroft will ride the Sydney train network to visit ALL 187 railway stations and Rotarians and Rotary Clubs have the opportunity to be part of the largest and most successful public Polio promotion in Australian Rotary history. Many clubs are already planning special activities to draw public attention to the event which involved the two Sydney Districts and should attract a colourful ‘army’ of red END POLIO NOW t-shirt ‘soldiers’. Suggested personal gifts of $187 – one dollar for each station. Canvas corporate supporters for $100 per station - $18,700. Remember, personal and corporate donations are tax deductible through the Australian Rotary Foundation Trust and will be boosted by the Gates ‘multiplier’. Members from all over the Sydney area (Districts 9685 and 9675) are urged to wear their red END POLIO NOW T-shirts and join trains at station of choice. Governor Susan and her entourage will join the train at Emu Plains Railway Station – where the Lower Blue Mountains Club is planning another END POLIO NOW barbecue to sell sausage sandwiches to commuters from 7 am. The club will have promotional material and banners on display, and distribute membership flyers to train travellers. All District Rotary Clubs are urged to make a ‘fun’ day of this excellent promotional initiative. Contact Mark Anderson on 0408 622 698 or email mark.anderson@rotary.org if you require further information on times and donations. 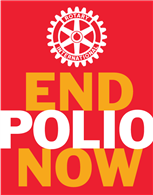 The big Rotary International news last week was announcement of a further US$96.8 million in grants to support the END POLIO NOW campaign. The announcement came as Nigeria marks two years without further reported cases of wild poliovirus – following four reported in 2016. The new grants support ongoing efforts in Nigeria ($16.1m), Afghanistan ($22.9m) and Pakistan ($21.7m) and underline the vital importance of continuing intensive fund raising efforts around the world to ensure surveillance and vaccination continues in vulnerable countries. Rotary is committed to raising US$50m per year to maintain the Gates Foundation support. US$1,500 per Club – to raise a world goal of US$50m. 20% or more from District Designated Funds (DDF) – goal of US$10m. Ongoing quest to attract major donors in all Districts – goal of US$4m.